Card games can be intimating to gamers new to the genre, conjuring up the image of grey-bearded men in dimly lit rooms playing secret games where the rules are only known to the select few and are passed down through generations. Even with digital versions, I myself find my interest waiving as soon as I see the 100 odd page wiki that accompanies some of the more famous ones. Who has time for that? I just want to play a game! Insane Robots aims to open up the genre by striping away the complication whilst maintaining a surprisingly level of logic and strategy. The developers have even tried to hide the fact that it’s a card game by dubbing it a “rogue-lite” 2D strategy game, but will they actually fool anyone or are they just insane? 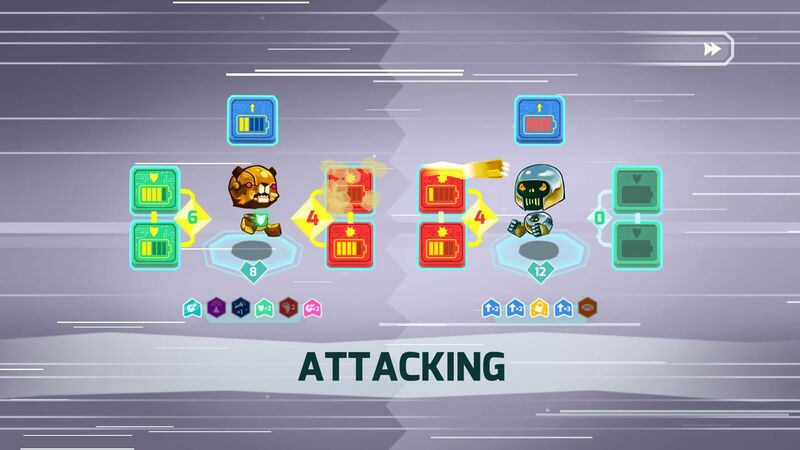 BASIC – To cut to the chase, in order to win the game, you need to build your attack circuit value higher than the opponents defense circuit and then launch your attack. Both the attack and defense circuits are comprised of 2 cards which you draw randomly from the deck. If the enemy’s defense is of equal value or is higher than your attack value, the attack will fail. If it succeeds, you’ll take a number of points off the enemies health. Similarly you will also need to ensure your defense circuit is able are able to withstand an enemy assault should they beat you in building their attack circuit quicker. It’s basically a simple game of math, albeit more fun than math class. 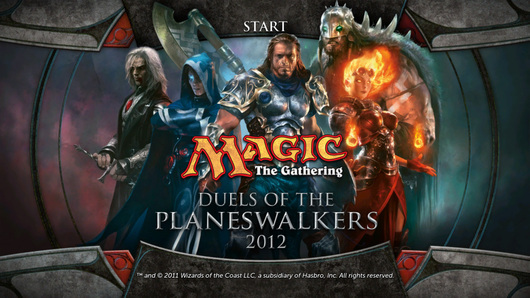 Placing cards on a circuit uses one move and as the battle continues you earn an increasing number of moves per turn. There are opportunities to earn extra moves in each turn by drawing special cards, or even by attaching special augments to your robot, that allow free moves for certain types of cards. Alike most card games, you can actually see the enemies circuits being built before they even launch an attack, this means you’ll want to use hack cards and glitch cards to sabotage the enemy and keep your circuit values higher than theirs. As the game progresses there are other neat tricks that can be employed, such as distractions, boosts and doublers though these are all introduced at a steady pace meaning you’re never overwhelmed with new information. 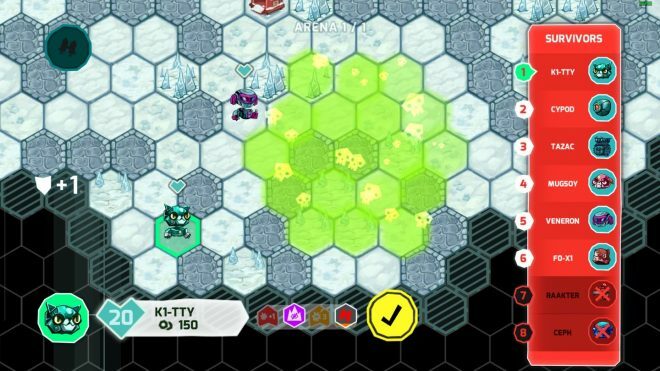 Do Until – Insane Robots isn’t just a card game, there’s also a fun board game to navigate between card battles. Set across a hexagram grid, you are launched into an arena with 9 other robots to beat. Each takes their turn travelling across the map, avoiding hazards like lightening and toxic gas clouds in order to face each other in battle. This is where some strategy comes into play as you soon realize that it’s often wise to take on a robot after they’ve been injured by an environmental hazard or even another robot. In fact, you can let each of the robots take each other out and then beat the last remaining one to earn a victory. Of course that won’t earn you the best map score and won’t set you up well for the later tournaments! Additionally there are cogs, the game’s currency, to find across the board. These can be spent the various vending machines, also littered throughout, where you can replenish health and purchase upgrades. More interestingly, there are mystery spaces where you play a sort of “choose your own adventure” style scenario. Depending on your choices, these may provide you with a small reward or even cause injury if you choose wrongly. Variables – Whilst there is no card collecting, the game does introduce you to new cards types at regular intervals, all of which will become part of the randomized deck during battles. These can be gained by winning tournaments or by finding them in your travels across the game board. 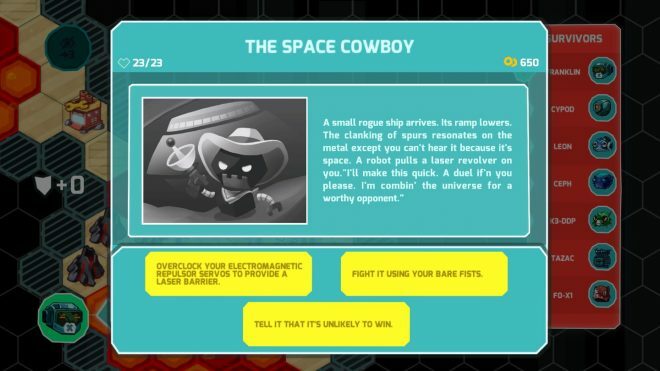 Augments can also be earned or purchased in vending machines, which can give your robot an advantage during both the map segments, for example by providing immunity to toxic gases, or during a card battle by allowing you to draw cards for free. This steady pace of new mechanics keeps the game fresh and challenging to the end. There are also newly playable robots to unlock after each tournament, though they don’t seem to offer any major changes other than a cool new sprite to chose from. I personally just picked to play as the ones I liked the look of best, to no adverse effect. Missing Parameters – Unfortunately the game’s narrative isn’t up to much. Some dull tale about a robot rebellion and robots losing their memory. To be fair we’re here for the card battles, not the next War and Peace, but the story still feels tacked on rather than an integral part of the single-player campaign. It’s a shame as the framework is there to deliver some decent lore, particularly during the board sections when you come across some role-playing style conundrums. Should we hack this terminal or save this robot from a swamp? Who cares, as it’ll be forgotten about after the next turn. 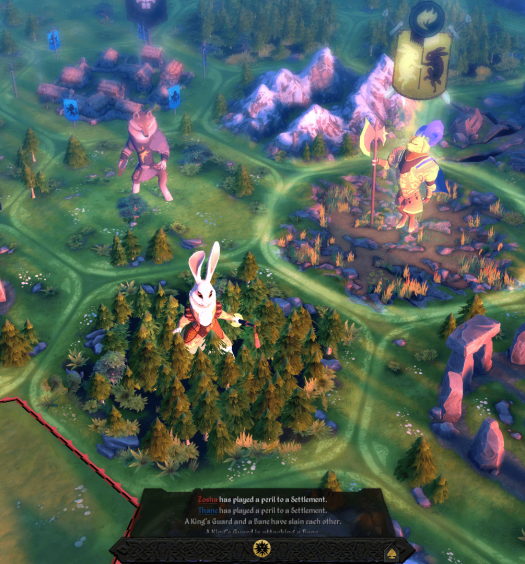 Error 404 – The game can be played single player against the AI or against other players either online or offline. Unfortunately, I was unable to find any other players online. A lack of player base is not necessarily the game developers fault, however, it serves as a reminder of design choices that could have been made such as cross play with other platforms, a free to play model, or perhaps even just an old-fashioned demo to pull players in. 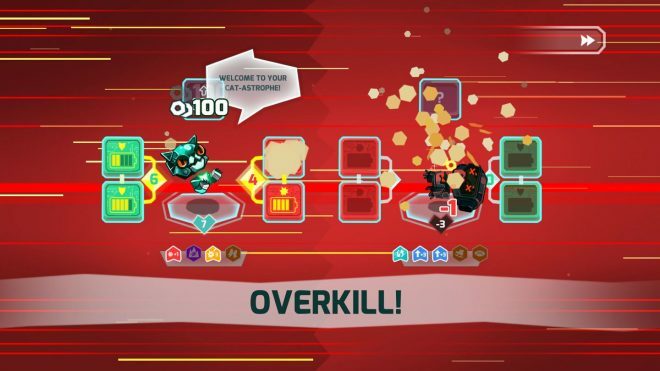 Overall Insane Robots is a well presented, fun little card battler. Its simplicity makes it an ideal game to start with if you’re new to card games, and the difficulty curve is spot on meaning you’ll be continuously challenged until the end and beyond. Whilst a multiplayer mode is available, given the lack of player base, you should view this as a single player game. However, the story could have done with some more depth to make the game a true standout; in fact, I would happily waive the multiplayer aspect for some better lore. That said, Insane Robots is an otherwise bright and cheerfully entertaining game for both newcomers and card game fanatics alike. Insane Robots was developed and published by Playniac. It was released July 13, 2018, for $19.99. A copy was provided for review purposes.